Herman Cain was born on December 13, 1945, in Memphis, Tennessee, to Lenora Davis Cain, a cleaning woman and domestic worker, and Luther Cain, who was raised on a farm and worked as a barber and janitor, as well as a chauffeur for The Coca-Cola Company President Robert W. Woodruff. Cain has said that as he was growing up, his family was "poor but happy." Cain related that his mother taught him about her belief that "success was not a function of what you start out with materially, but what you start out with spiritually." His father worked three jobs to own his own home—something he achieved during Cain's childhood—and to see his two sons graduate. Cain grew up on the west side of Atlanta, Georgia, attending school and the Rev. Cameron M. Alexander's Antioch Baptist Church North in the neighborhood now known as The Bluff. Eventually Cain's father saved enough money and the family moved to a modest brick home on Albert Street in the Collier Heights neighborhood. He attended Archer (public) High School, graduating in 1963. Cain married Gloria Cain (née Etchison), of Atlanta, soon after her graduation from Morris Brown College in 1968. Gloria Cain is a homemaker, with experience as a teacher and a librarian. The couple have two children and three grandchildren. In 2006 Cain was diagnosed with Stage IV cancer in his colon and metastases to his liver and given a 30 percent chance of survival. Cain underwent surgery and chemotherapy following the diagnosis, and has since reported that he is in remission. Disclosures filed during his campaign in 2011 categorized Cain's wealth at that time as being between $2.9 and $6.6 million, with Cain's combined income for both 2010 and 2011 being between $1.1 and $2.1 million. Cain also serves as an associate minister at Antioch Baptist Church North in Atlanta, which he joined at the age of 10. The church is part of the National Baptist Convention and is politically liberal and theologically conservative; the church's senior pastor, Rev. Cameron M. Alexander, did not share Cain's political philosophy. In 1967, Cain graduated from Morehouse College with a Bachelor of Science in Mathematics. In 1971, he received a Master of Science in Computer Science from Purdue University, while working full-time as a ballistics analyst for the U.S. Department of the Navy as a civilian. At age 36, Cain was assigned in the 1980s to analyze and manage 400 Burger King stores in the Philadelphia area. At the time, Burger King was a Pillsbury subsidiary. Under Cain, his region posted strong improvement in three years. According to a 1987 account in the Minneapolis Star Tribune, Pillsbury's then-president Win Wallin said, "He was an excellent bet. Herman always seemed to have his act together." At Burger King, Cain "established the BEAMER program, which taught our employees, mostly teenagers, how to make our patrons smile" by smiling themselves. It was a success: "Within three months of the program's initiation, the sales trend was moving steadily higher." Cain's success at Burger King prompted Pillsbury to appoint him president and CEO of another subsidiary, Godfather's Pizza. On his arrival on April 1, 1986, Cain told employees, "I'm Herman Cain and this ain't no April Fool's joke. We are not dead. Our objective is to prove to Pillsbury and everyone else that we will survive." Godfather's Pizza was performing poorly, having slipped in ranks of pizza chains from third in 1985 to fifth in 1988. Under Cain's leadership, Godfather's closed approximately 200 restaurants and eliminated several thousand jobs, and by doing so returned to profitability. In a leveraged buyout in 1988, Cain, executive vice president and COO Ronald B. Gartlan, and a group of investors bought Godfather's from Pillsbury. Cain left Godfather's Pizza in 1996 and moved to Washington, D.C. From 1996 to 1999 he served as CEO of the National Restaurant Association, a trade group and lobbying organization for the restaurant industry, on whose board of directors he had previously served. Cain's lobbying work for the association led to a number of connections to Republican lawmakers and politicians. Under Cain's leadership, the Association lobbied against increases to the minimum wage, mandatory health care benefits, regulations against smoking, and lowering the blood alcohol limit that determines whether one is driving under the influence. Cain was on the board of directors of Aquila, Inc., Nabisco, Whirlpool, Reader's Digest, and AGCO, Inc.
After Cain's term with the restaurant advocacy group ended in 1999, he returned to Omaha for about a year, then moved to his hometown of Atlanta in 2000. Cain writes a syndicated op-ed column, which is distributed by the North Star Writers Group. Cain appeared in the 2009 documentary An Inconvenient Tax. From 2008, until February 2011, Cain hosted The Herman Cain Show on Atlanta talk radio station WSB. On January 19, 2012, Cain began working for WSB again by providing daily commentaries, while occasionally filling in for Erick Erickson and Neal Boortz. On October 1, 2012, Cain began writing weekly online columns for the media organization Newsmax, in a series titled "9–9–9 To Save America". Cain took over Boortz's radio talk show on January 21, 2013, upon Boortz's retirement. The program is heard weekdays on WSB from 9 a.m. to noon. The show was dropped from the Westwood One Radio Network in December 2016 in favor of The Chris Plante Show, continuing to air in limited syndication through WSB's owner, Cox Radio. On February 15, 2013, Fox News Channel announced Cain would join the network as a contributor. In March 2019, Cain was a panelist on a Watter's World episode. Cain received the 1996 Horatio Alger Award and has received honorary degrees from Creighton University, Johnson & Wales University, Morehouse College, the University of Nebraska–Lincoln, the New York City College of Technology, Purdue University, Suffolk University, and Tougaloo College. Former Secretary of Housing and Urban Development Jack Kemp referred to Cain as "the Colin Powell of American capitalism". Kemp stated that Cain's "conquests won't be counted in terms of countries liberated or lives saved, but in those things that make life worth living—expanding opportunity, creating jobs and broadening horizons, not just for those he knows, but through his example, for those he'll never meet." Reports dating to January 2019 were given direct confirmation by President Donald Trump in early April 2019 that, once background checks were complete, he intended to nominate Cain to the second of the two vacant seats on the Federal Reserve Board. Assessing the nomination news, news publications reviewed Cain's 2012 presidential campaign, including details of the sexual misconduct allegations that preceded his withdrawal from the race in December 2011 and Cain's defenses and denials in regards to the allegations and settlements in the cases. In a Facebook video, Cain acknowledged that completing the nomination process would be "more cumbersome" for him due to his "unusual career." The Clintons would later blame "Harry and Louise," the fictional couple in the ads aired by the insurance industry, for undermining health reform. But the real saboteurs are named Herman and John. Herman Cain is the president of Godfather's Pizza and president-elect of the National Restaurant Association. An articulate entrepreneur, Cain transformed the debate when he challenged Clinton at a town meeting in Kansas City, Missouri. Cain asked the president what he was supposed to say to the workers he would have to lay off because of the cost of the "employer mandate". Clinton responded that there would be plenty of subsidies for small businessmen, but Cain persisted. "Quite honestly, your calculation is inaccurate," he told the president. "In the competitive marketplace it simply doesn't work that way." Because Kemp was impressed with Cain's performance, he chartered a plane to Nebraska to meet Cain after the debate. As a result, Cain was appointed to the Kemp Commission in 1995. Joshua Green of The Atlantic called Cain's exchange with President Clinton his "auspicious debut on the national political stage." Cain was a senior economic adviser to the Bob Dole presidential campaign in 1996. Cain briefly ran for the Republican presidential nomination in 2000; he says it was more about making political statements than winning the nomination. "George W. Bush was the chosen one, he had the campaign DNA that followers look for." However, Cain went on to state, "I believe that I had a better message and I believe that I was the better messenger." After ending his own campaign, however, he endorsed Steve Forbes. In 2004 Cain ran for the U.S. Senate in Georgia and did not win in the primaries. He was pursuing the seat that came open with the retirement of Democrat Zell Miller. Cain sought the Republican nomination, facing congressmen Johnny Isakson and Mac Collins in the primary. Collins tried to paint Cain as a moderate, citing Cain's support for affirmative action programs, while Cain argued that he was a conservative, noting that he opposed the legality of abortion except when the mother's life is threatened. Cain finished second in the primary with 26.2% of the vote, ahead of Collins, who won 20.6%, but because Isakson won 53.2% of the vote, Isakson was able to avoid a runoff. Starting in 2005, Cain worked for the political advocacy group Americans for Prosperity (AFP) alongside Mark Block. Block would later become campaign manager for Cain's 2012 presidential run and would be joined in Cain's campaign by several other AFP employees. Cain continued to receive honorariums for speaking at AFP events until he announced his campaign for the Republican nomination. Cain's senior economic advisor during his 2012 presidential campaign, Rich Lowrie, who helped devise Cain's 9–9–9 tax plan, had served on the AFP board. In 2006, Cain voiced several radio ads encouraging people of color to vote Republican; the ads were funded by a group called America's PAC and its founder J. Patrick Rooney. A Tea Party activist, he was a candidate for the 2012 Republican presidential nomination. Cain addressed numerous Tea Party rallies in 2010. On September 24, he announced that he was considering a run for president in 2012 as a Republican. In December, Cain was the "surprise choice" for 2012 GOP nominee in a RedState.com reader poll. Cain announced the formation of a presidential exploratory committee on January 12, 2011 before formally announcing his candidacy on May 21 in Atlanta. Cain's addresses to conservative groups were well received, and in late September and early October 2011, Cain won the straw polls of the Florida Republican Party, TeaCon, and the National Federation of Republican Women's Convention. "My focus groups have consistently picked Herman Cain as the most likeable candidate in the debates," said GOP pollster Frank Luntz. "Don't underestimate the power of likability, even in a Republican primary. The more likeable the candidate, the greater the electoral potential." In July 2011, an advisor suggested that his campaign's tax policy plan be called "the Optimal Tax", but Cain rejected the name, saying "we're just going to call it what it is: 9–9–9 Plan." The plan would replace the current tax code with a 9-percent business transactions tax, a nine percent personal income tax, and a 9-percent federal sales tax. During a debate on October 12, Cain said his plan "expands the base", arguing that "when you expand the base, we can arrive at the lowest possible rate, which is 9–9–9." An analysis released to Bloomberg News by the campaign claimed that the rate for each of the three taxes could in fact be as low as 7.3%, but "poverty grants"—which Cain has described as a lower rate in targeted "empowerment zones"—necessitated a national rate of nine percent. Paul Krugman has criticized the plan, saying it shifts much of the current tax burden from the rich to the poor. Arthur Laffer, Lawrence Kudlow, the Club for Growth, and Congressman Paul Ryan have spoken favorably of the plan. On October 21, Cain told a crowd in Detroit that the plan would be 9–0–9 for the poor, saying that "if you are at or below the poverty level ... then you don't pay that middle nine on your income." Cain's 9–9–9 plan attracted skepticism from his fellow candidates at numerous Republican debates. In late October 2011, Politico reported that Cain had been accused by two women of sexual harassment and misconduct during his time as CEO of the National Restaurant Association in the late 1990s. Two other women made additional harassment accusations later on. Cain acknowledged that the restaurant organization made financial settlements to the complainants. Of the four women, two of them came forward publicly: Sharon Bialek and Karen Kraushaar. On November 28, 2011, Cain asserted that a woman named Ginger White claimed to have had an affair with him and that the allegation was not true. In an interview with White, which aired on the same day, she stated that the affair lasted 13 years and ended right before Cain announced his presidential campaign. On November 30, 2011, Herman Cain denounced the allegations of sexual harassment and adultery at an event in Dayton, Ohio. On December 3, 2011, Cain suspended his campaign, following allegations of sexual harassment and adultery, which he denied, but were widely considered responsible for the sharp drop in his poll numbers. According to a Pew Research Center report on December 21, 2011, Cain was the "most covered candidate" among the Republicans during that year. On January 4, 2012, Cain announced the "Cain's Solutions Revolution". Cain's stated goal was to get commitments from members of Congress to support the 9–9–9 Plan before the 2012 elections. Cain stated that he started a new movement because the "biggest comment I got when I ended my candidacy was to keep 9–9–9 alive. That's what this is about, and I'm going to keep it alive with what I'm calling Cain's Solutions Revolution." In order to promote this movement, Cain was using both a bus tour and a new website. New York magazine stated, "It's Cain's earnest effort to keep 9–9–9 alive and focus on solutions." On January 20, 2012, Cain spoke at Stephen Colbert's "Rock Me Like a Herman Cain: South Cain-Olina Primary Rally". The Huffington Post reported the crowd size was between 3,000 and 5,000 people. It had been called "the largest campaign rally so far during this GOP presidential primary season", and "the biggest political rally of the primary season." For President Barack Obama's 2012 State of the Union address, the Tea Party Express chose Cain to give its second annual response. After Indiana Governor Mitch Daniels gave the official GOP response, Cain delivered his speech at the National Press Club. The speech was streamed live on the Tea Party Express website. Cain referred to Obama's address as a "hodgepodge of liberal ideas," adding that there were "no big ideas that would impact job growth" and "no big ideas that would stimulate economic growth in this country." Although Mitt Romney was endorsed by Cain on May 15, 2012, he would eventually lose the general election to President Obama. Cain then told Bryan Fischer that the Republican Party no longer represented the interests of conservatives in the United States and that it did not have "the ability to rebrand itself." He believed that "a legitimate third party" would be needed to replace it. "The Intangibles of Implementation" in the technical journal Interfaces (Vol. 9, No. 5, 1979, pp. 144–147), published by the Institute for Operations Research and the Management Sciences (INFORMS). Leadership is Common Sense (2nd ed.). Tapestry. November 2000 [first published 1997]. ISBN 978-1-930819-02-3. Speak as a Leader. Lebhar-Friedman Books. December 1999. ISBN 978-0-86730-782-5. CEO of SELF. Tapestry. August 2001. ISBN 978-1-930819-04-7. They Think You're Stupid. Stroud & Hall. June 10, 2011 [first published 2005]. ISBN 978-0-9796462-7-0. This is Herman Cain! : My Journey to the White House. Threshold Editions. October 2011. ISBN 978-1-4516-6613-7. 9–9–9: An Army of Davids. Velocity Mascot. May 1, 2012. ISBN 978-1-62086-030-4. ^ "Cain, Herman". Current Biography Yearbook 2011. Ipswich, MA: H.W. Wilson. 2011. pp. 102–106. ISBN 9780824211219. ^ King Jr., Neil (May 9, 2011). "GOP Debate Fuels a Long Shot". The Wall Street Journal. Retrieved May 16, 2011. ^ "Herman Cain 2012: The Story of a Self-Made Man". Ibtimes.com. May 21, 2011. Retrieved August 6, 2011. ^ Poe, Janita (October 19, 2011). "Yolande M. Minor, "The Herman Cain of Atlanta's West Side", Cascade Patch, October 19, 2011". Cascade.patch.com. Retrieved January 15, 2012. ^ Drash, Wayne (November 1, 2011). "'Team Cain': A portrait of the candidate's marriage". CNN. Archived from the original on January 21, 2012. ^ a b c Pappas, Alex (May 19, 2011). "Herman Cain: My wife will not be traditional 'campaign wife'". Daily Caller. ^ "Cain, Herman (1945–)". blackpast.org. Retrieved October 11, 2011. ^ "Docs: Herman Cain's Cancer Is Not Disqualifying". Rolling Stone magazine. October 13, 2011. Retrieved October 31, 2011. ^ a b c Jordon, Steve (October 11, 2011). "Cain: The Godfather's years". Omaha World-Herald. Archived from the original on January 30, 2013. ^ Brody, David (March 22, 2011). "Herman Cain's Story of God's Healing Power". Christian Broadcasting Network. Retrieved June 6, 2011. ^ "Antioch Baptist Church North : Atlanta, Georgia". USA Churches. Retrieved June 6, 2011. ^ Marrapodi, Eric; Blake, John. "The liberal church of Herman Cain". CNN. October 18, 2011. ^ Hallowell, Billy. "Herman Cain remains conservative despite his church's staunchly liberal leanings". The Blaze. October 18, 2011. ^ "Herman Cain on Civil Liberties and Civil Rights – Civil Liberties Views of Herman Cain". Civilliberty.about.com. Retrieved January 15, 2012. ^ a b c d Berg, Eric (September 20, 1988). "Godfather's Pizza Sold By Pillsbury". The New York Times. Retrieved December 19, 2011. ^ Earl G. Graves (February 1988). "Godfather's Pizza: This Pizza Man Delivers". Black Enterprise: 89. ^ Cain, H. (1979). "The Intangibles of Implementation". Interfaces. Institute for Operations Research and the Management Sciences (INFORMS). 9 (5): 144–147. doi:10.1287/inte.9.5.144. JSTOR 25059827. ^ a b c d Henninger, Daniel (September 29, 2011). "Taking Cain Seriously". The Wall Street Journal. ^ St. Anthony, Neal (July 26, 1987). "Executive resuscitates faltering Godfather's". Scripps Howard News Service. ^ St. Anthony, Neal (October 30, 2011). "Herman Cain's career at Pillsbury is a tale of two turnarounds". Star Tribune. ^ "This Is Candidate Cain". National Review Online. Retrieved October 9, 2011. ^ a b c Thomas M. Hoenig, president and chief executive officer (May 26, 2011). "Herman Cain's Service as a Director of the Federal Reserve Bank of Kansas City" (PDF). kansascityfed.org. Archived from the original (PDF) on June 17, 2011. Retrieved October 28, 2011. ^ Sickinger, Ted (August 27, 1996). "KCP&L head temporarily fills KC Fed Bank post". Kansas City Star. p. D.20. ^ Stoberg, Sheryl Gay (October 22, 2011). "Cain, Now Running as Outsider, Came to Washington as Lobbyist". The New York Times. ^ Thompson, Karen (November 3, 2011). "For Cain, some troubles as trade group chief". The Washington Post. Retrieved November 14, 2011. ^ a b Herman Cain. 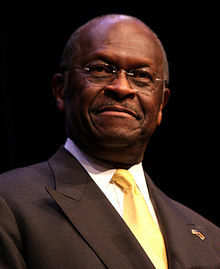 "Executive Profile: Herman Cain". Investing.businessweek.com. Retrieved August 6, 2011. ^ "Herman Cain (profile)". Forbes.Com. Archived from the original on May 9, 2011. Retrieved May 28, 2011. ^ "Herman Cain & Hillary Clinton: More In Common Than You Think". The Political Vine. July 17, 2004. Retrieved February 6, 2012. ^ "Author Archive". North Star Writers Group. ^ "Interviewees". An Inconvenient Tax. Retrieved January 27, 2012. ^ "The Herman Cain Show:A podcast powered by FeedBurner". WSB Radio. ^ a b "Herman Cain rejoins WSB Radio with daily commentaries". The Atlanta Journal-Constitution. ^ "Herman Cain – 9–9–9 To Save America". Newsmax. Retrieved December 17, 2013. ^ Poor, Jeff (June 4, 2012). Confirmed: Boortz to retire, Cain to take over radio show [audio]. The Daily Caller. Retrieved June 4, 2012. ^ "The Herman Cain Radio Show will be loud and strong in 2017". Herman Cain. Retrieved December 20, 2016. ^ "Herman Cain announced as Fox News Channel contributor". Washington Times. Retrieved February 16, 2013. ^ "'Donald Trump' and 'Kim Jong Un' trade jabs on 'Watters' World'" (rush transcript), Fox News, March 2, 2019. Retrieved 2019-04-06. ^ "Herman Cain". Horatio Alger Association of Distinguished Americans. Retrieved May 20, 2011. ^ "The Entrepreneur's Creed: The Principles & Passions of 20 Successful Entrepreneurs". Armour Publishing Pte Ltd. August 15, 2018 – via Google Books. ^ Rappeport, Alan, Neil Irwin and Maggie Haberman, "Trump Says He Wants Herman Cain, Former Pizza Executive, for Fed Board", April 4, 2019. Retrieved 2019-04-06. ^ Roberts, John (host), "President Trump praises Mexican efforts to stop migrants: They're apprehending people by the thousands", Fox News "Special Report", April 5, 2019. Retrieved 2019-04-06. ^ Bach, Natasha, "A Refresher on Herman Cain, Trump's Latest Pick for the Fed Board", Fortune (magazine), April 5, 2019. Retrieved 2019-04-06. ^ Rappeport, Alan, and Kenneth P. Vogel, "Herman Cain Opens a New #MeToo Minefield for Republicans", New York Times, April 5, 2019. Retrieved 2019-04-06. ^ Kimball, Spencer, "Herman Cain on possible Fed nomination: ‘The people who hate me are digging up negative stuff’", CNBC, April 6, 2019. Retrieved 2019-04-06. ^ Cohn, Bob (September 19, 1994). "The Lost Chance". Newsweek. Retrieved June 6, 2014. ^ "Cain should impress voters". The Albany Herald. September 1, 2003. Retrieved December 3, 2011. ^ Costa, Robert (June 6, 2011). "Herman Cain's Kemp Connection". National Review. Retrieved April 7, 2019. ^ Weiner, Rachel (September 26, 2011). "Herman Cain's Kemp Connection". The Washington Post. Retrieved October 3, 2011. ^ : admin (January 13, 2007). "Herman Cain". Rlc2011.com. p. m. Retrieved August 6, 2011. ^ Lewis, Matt. "Herman Cain: Possible 'Dark Horse' 2012 GOP Presidential Candidate". Politics Daily. Retrieved June 24, 2011. ^ Weiner, Rachel (September 27, 2011). "Herman Cain explained". The Washington Post. Retrieved October 3, 2011. ^ Roig-Franzia, Manuel (July 18, 2004). "Cain Makes Inroads in Ga. Senate Bid". The Washington Post. ^ "Three Republicans battling for spots in Georgia's likely Senate runoff". New.accessnorthga.com. March 27, 2004. Archived from the original on May 29, 2012. Retrieved August 6, 2011. ^ "United States Senator". Sos.georgia.gov. Retrieved August 6, 2011. ^ "Long Ties to Koch Brothers Key to Cain's Campaign". ABC News. October 16, 2011. ^ "Republican Group Chides Democrats With Abortion Ads". ^ a b Mark Memmot. "GOP Presidential Contender Takes Lead in Second Poll". NPR. ^ Pappas, Alex (September 24, 2010). "Herman Cain, former Godfather's Pizza CEO, is contemplating 2012 run". The Daily Caller. Retrieved September 24, 2010. ^ Travis, Shannon (January 12, 2011) "Herman Cain talks to CNN on announcing presidential exploratory committee", CNN. Retrieved January 12, 2011. ^ Bernstein, David S. (January 12, 2011) 'Avoiding the "First Primary'? ", The Boston Phoenix. Retrieved January 12, 2011. ^ "Tea Party Favorite Herman Cain Joins 2012 GOP Race". Fox News. April 7, 2010. Retrieved August 6, 2011. ^ a b "Cain upsets Perry in Florida Republican straw poll". Reuters. September 24, 2011. Retrieved September 25, 2011. ^ NBC's Anthony Terrell. "First Read – Cain wins another straw poll". Firstread.msnbc.msn.com. Retrieved January 15, 2012. ^ Riley, Jason L. (October 7, 2011). "Cain's Post-Racial Promise". The Wall Street Journal. Retrieved October 9, 2011. ^ Abcarian, Robin (October 18, 2011). "Vegas debate: GOP rivals jump on Herman Cain's '9–9–9' plan". Los Angeles Times. Retrieved November 10, 2011. ^ Martin, Jonathan; Maggie Halberman; Anna Palmer; Kenneth Vogel (October 31, 2011). "Herman Cain accused by two women of inappropriate behavior". Politico. Retrieved October 31, 2011. ^ Shear, Michael (October 30, 2011). "Report Cites Women's Claims of Inappropriate Acts by Cain". New York Times. Retrieved October 31, 2011. ^ Kucinich, Jackie (November 8, 2011). "Herman Cain's accusers: What's been made public". USA Today. Retrieved November 15, 2011. ^ Madison, Lucy; Montopoli, Brian (November 28, 2011). "Woman claims 13-year affair with Herman Cain". CBS News. Retrieved November 28, 2011. ^ Oliphant, James (December 3, 2011). "Herman Cain drops out of presidential race". Los Angeles Times. Retrieved December 3, 2011. ^ Lin, Joy (December 2, 2011). "Cain Poll Numbers Plummet in Iowa". Fox News. Retrieved December 3, 2011. ^ "The Year in the News 2011: Top Newsmakers". Project for Excellence in Journalism. Pew Research Center. December 21, 2011. ^ Stableford, Dylan (January 4, 2012). "Herman Cain launches 'Cain's Solutions Revolution' to 'keep 999 alive'". The Ticket. Yahoo! News. Retrieved January 4, 2012. ^ Summers, Juana (January 4, 2012). "Herman Cain to launch 9–9–9 bus tour". Politico. Retrieved January 4, 2012. ^ "Cain aims to keep 9–9–9 alive". PoliticalTicker... CNN. January 4, 2012. Retrieved January 4, 2012. ^ Smiley, Brett (January 4, 2012). "Herman Cain to Ride Around Promoting 9–9–9 on 'Cain's Solutions Revolution' Bus Tour". New York. Retrieved January 4, 2012. ^ a b Katz, Matt (January 21, 2012). "Colbert channels Cain in big anti-rally". The Philadelphia Inquirer. Retrieved January 21, 2012. ^ Lewis, Andy (January 21, 2012). "Stephen Colbert's Rally for Herman Cain Draws Record Crowd in South Carolina". The Hollywood Reporter. Retrieved January 21, 2012. ^ "Herman Cain Delivers Tea Party Response to SOTU Tonight!" (Press release). Tea Party Express. January 24, 2012. Retrieved January 25, 2012. ^ a b Weinger, Mackenzie (January 25, 2012). "Herman Cain: 'Stop the blame game'". Politico. Retrieved January 25, 2012. ^ Reilly, Ryan J. (January 24, 2012). "'We Ain't Stupid': Herman Cain Responds To State Of The Union". Talking Points Memo. Retrieved January 25, 2012. ^ Chandler, D.L. (January 25, 2012). "Herman Cain Responds To Obama's Speech With Tea Party Rebuttal". News One for Black America. Radio One. Retrieved January 25, 2012. ^ "Cain: 'We deserve better'". UPI. January 24, 2012. Retrieved January 25, 2012. ^ "Cain endorses Romney, urges Republicans to 'get over' doubts about presumptive nominee". Fox News. May 16, 2012. Retrieved May 16, 2012. ^ Kranish, Michael (December 22, 2012). "The story behind Mitt Romney's loss in the presidential campaign to President Obama". Boston Globe. Archived from the original on May 28, 2013. Retrieved April 6, 2019. ^ Seitz-Wald, Alex (November 7, 2012). "GOP civil war: Herman Cain calls for 3rd party". salon.com.